Breakfast at Bill’s has now become a Brighton institution. The atmosphere is great and the venue is pretty damn uber cool. Fresh, quality ingredients make for an impressive breakfast, however portion sizes could perhaps be a little more generous but this is easily remedied by ordering extras! Be prepared to get there early or you’ll find yourself in a queue, which is still well worth it. With the venue, atmosphere and food it’s our top of the pops! One of Brighton’s best kept secrets, Billie’s is tucked behind Western Road. If you’re looking for a breakfast that packs a punch and will keep you going till tea time then Billie’s is your place. As well as the usual fry up options this places offers something a little more for the discerning brekkie connoisseur with eggs florentine and eggs benedict amongst the options. A good old fry up cafe but with panache. Set within a beautiful botanical backdrop, the Redroaster of today provides a little bit of everyday luxury. 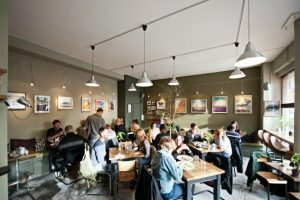 As well as their ethically sourced, hand-roasted coffee, Red Roaster serve breakfast, brunch and lunch carefully prepared by a team led by Matt Gillan (holder of a Michelin Star for five years and winner of the BBC’s Great British Menu). 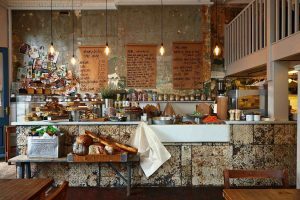 Marmalade serves breakfast, lunch and incredible coffee in a rustic yet beautifully styled corner café. 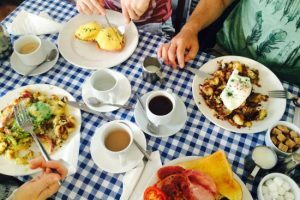 Breakfast is made to order from a set menu and although they don’t offer the traditional full English breakfast, we don’t think anyone could leave feeling hard done by. The food coupled with the friendly team make Marmalade the perfect breakfast spot. Kensington’s is a lovely little café situated in the North Laines of Brighton. It has a cute little balcony where you can sit and watch the world go by. They serve some gut busting breakfasts alongside some lighter options. The staff are warm and friendly and there is always a pleasant atmosphere with lots of music. 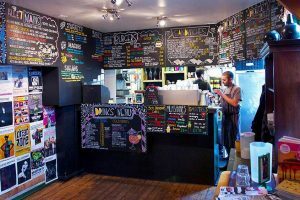 Located just opposite St Peter’s Chuch near London Road, Moksha serve up delicious breakfast, brunch & lunch using fresh, local and ethical produce. 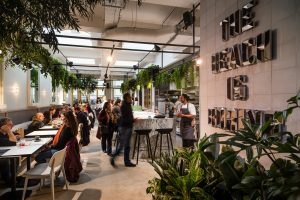 Since opening, their take on the modern breakfast has fast become a local favourite. However, it’s not just their classics that are getting the attention. The Mexican inspired, Huevos Rancheros, has appealed to Brighton’s desire for something a bit different and is a must-try! 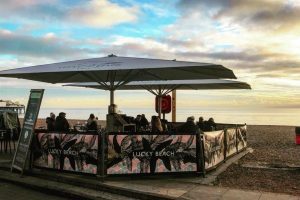 Open year-round, Lucky Beach Cafe serves up local, sustainable and mostly organic food and drink right in the middle of Brighton beach. With indoor and (heated) al-fresco seating, there are options all year round. Great for breakfast or brunch options and great coffee (made in their own roastery up the road! ), definitely worth a visit if the weather allows. This happens to be a French café however they make a pretty good version of an English breakfast. 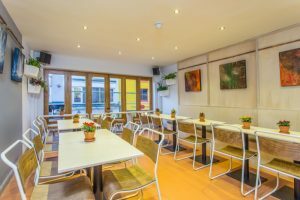 The cafe has a laid back arty atmosphere and a lovely seated area outside which is perfect for sunny afternoons. The service is first rate and the staff are extremely polite and courteous. The food does have a Gallic twist serving a chunky Toulouse sausage alongside a more ciabatta style bread with your fry up. Everything is fresh, well-cooked and beautifully presented. 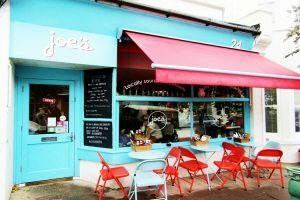 Winner of Best Café in Brighton & Hove 2015, Joe’s Café serves up a mountain of a breakfast! Their famous dish Hashegeddon is a favourite with the locals. All of the prices are reasonable and the staff extremely friendly. This is a great café, but not particularly centrally located. Well worth a taxi ride or morning walk! 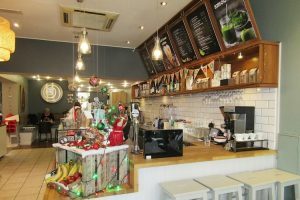 Established in 1998 Infinity Foods Kitchen is the cafe branch of the Infinity Foods Co-operative Ltd. Ethically run and providing tasty organic, vegetarian, vegan and gluten free wholefoods in the North Laines. 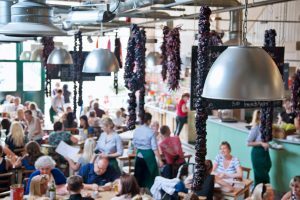 Dishes on offer vary daily but include dishes such as tasty veggie curries and large mezze platters, vegan breakfasts and delicious cakes. The café itself is light and airy and has an upstairs seating overlooking the shoppers below. Some seating available outside in the summer. Very busy around lunchtimes but well worth the wait.